Born in Florence, countertenor Filippo Mineccia, quickly gained international recognition as one of the greatest specialist in the repertoire of the great castrato era. As a child, he begins his singing studies at the Fiesole School of Music, joining its polyphonies Choir. He then pursues his training as a cellist and a singer, graduating from the Luigi Cherubini Music Conservatroy in Florence, studying with Gianni Fabbrini and Donatella Debolini. Whilst a student, Filippo Mineccia distinguishes himself by winning prizes both from national and international singing competitions. He also begins to collaborate with ensembles such as Il Complesso Barocco, La Capella della Pietŕ de Turchini, Collegium Marianum, Capella Krakoviensis, Accademia Bizantina, Divino Sospiro, I Barocchisti, La Folia Barockorchester, Zucker Kammerorkestera and Auser Musici. He also worked very early with such renowned conductors such as the late Alan Curtis, Ottavio Dantone, Diego Fasolis, Antonio Florio, Michael Hofstetter, Ruben Jais, and Enrico Onofri with whom he still regularly collaborates. Operatic roles include title role of Giulio Cesare and Tolomeo with the Accademia Bizantina and the Complesso Barocco, Telamone Ercole sul Termodonte by Vivaldi, Nerone Ottavia Restituita al Trono by Scarlatti, Purcells The Fairy Queen (Hagen City Theatre), Alessandro Tolomeos Re dEgitto, Unulfo Rodelinda with the Capella Cracoviensis under Maestro Adamus, Dardano Amadigi with the Kammerochester Basel under Ottavio Dantone (Versailles, Basel and Halle), Tamerlano Bajazet by Gasparini working with Carlo Ipata. Very much in demand on the oratorio platform, his repertoire includes Passione and Stabat Mater by Francesco Provenzale with La Capella de Turchini (Misteria Paschalia Festivalin Krakow), San Pietro Passione by Caldara (La Chaise Dieu Festival, France), Handels Dixit Dominus, Purcells Te Deum with the Orchestra Barroca Catalana, and Haydns Missa Cellensis under Maestro Filippo Maria Bressan. Recent and future engagements include Carmina Burana at the Teatro dellOpera in Rome, the title role in Silla conducted by Enrico Onofri (Handel Festival in Halle), Ottone Agrippina in a new Robert Carsen production, conducted by Thomas Hegelbroock (Theater an der Wien), Endimione La Calisto (Strasbourg) with Christophe Rousset and Mariame Clément for the staging, Ottone LIncoronazione di Poppea with Jean-Christophe Spinosi (Liceu, Barcelona), and concerts of Les sept Péchés capitaux with Leonardo Alarcon and the Cappella Mediterranea on Tour. His discography is marked by a flourishing collaboration with the label Glossa, recording three Oratorios by Gaetano Veneziano Ladorazione dei Magi, Il Tesoro di San Gennaro, and La Santissima Trinitŕ with the ensemble I Turchini di Antonio Florio, as well as Bajazet. Filippo also recorded Giulio Cesare (title role) and Tolomeo with the Accademia Bizantina and Complesso Barocco (Naďve recording), Ercole sul Termodonte by Antonio Vivaldi (DVD with Dynamic). As the smart Demetrio (Counter Filippo Mineccia) sings himself into such a range, that he first tatters his shirt, then tears out the cables and pulls the plug in order to quieten the storm of images, this is certainly meant to be a self ironic punch line. Without doubt the scenic applause that followed inspired the fabulous Italian even more… for the second time (after his Lucio Cornelius Silla three years ago) Mineccia perfectly convinces in the role of the lover, who loves the “wrong” woman. 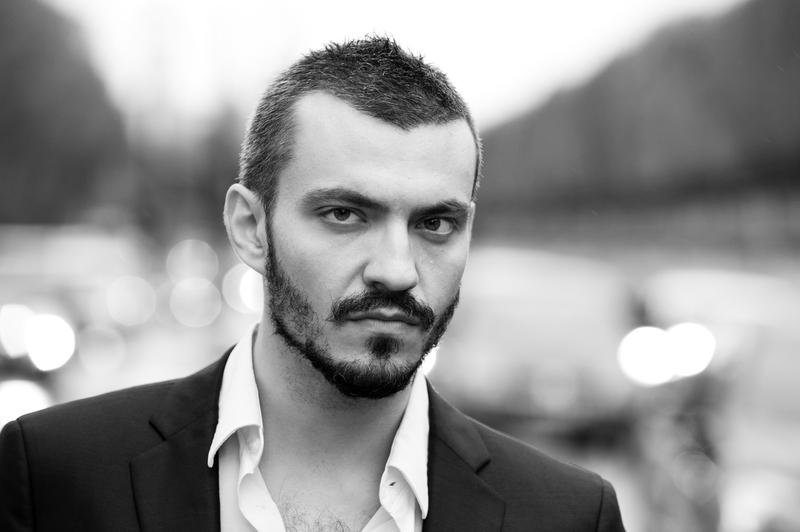 ... the Italian countertenor Filippo Mineccia elicits elegant,melodious tones from his pliant throat. 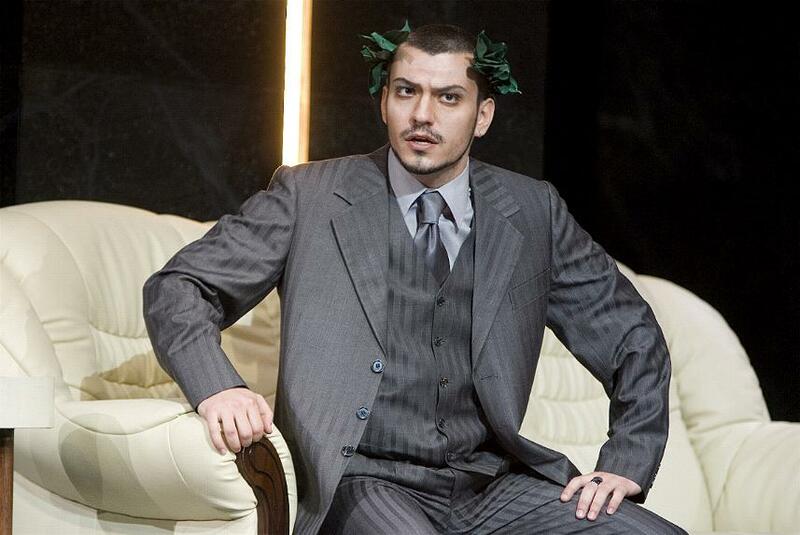 With his brilliant timbre, his perfect technique and his powerful charisma the Italian countertenor Filippo Mineccia as Orontes outshone the entire ensemble. 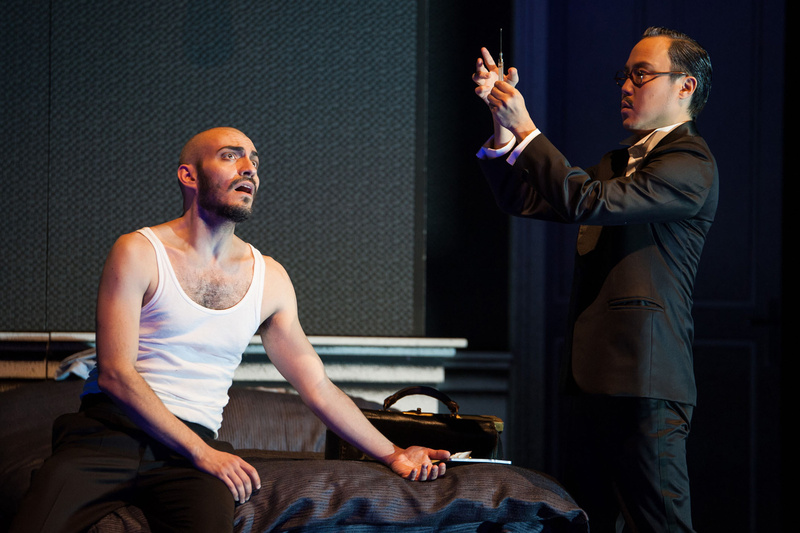 Mineccia is a countertenor one can only wish for: powerful, extremely virtuoso and experienced in its best sense. He just knows how to handle Händel/Telemann.